I would like to tell you a meandering batch of stories about art and music and love which will eventually tie into the review at hand in a sidelong manner. 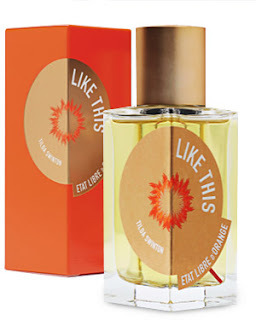 If you want to skip all that and get right to my opinion of Etat Libre d'Orange's Tilda Swinton-themed fragrance Like This, just scroll way down until you see the bottle again: I certainly wouldn't blame you. Last spring I was visiting my mother in Ontario for a couple of weeks: she had been widowed the previous fall and wanted some company (and also someone to do chores: she's not getting any younger). Reading the Toronto Star one morning, I discovered that an arts festival called Luminato in Toronto was opening with a revival of Philip Glass' pivotal, revolutionary opera Einstein on the Beach, which I had been listening to for at least a quarter of a century and of course desperately wanted to see, not least because I knew that I would never get another chance to see it: it's a huge, expensive production which has been revived only a few times since its first production in the mid-1970s. But a trip to see it was out of the question: we had already planned and paid for a trip to Tokyo that fall, and we couldn't possibly squeeze in another trip. I knew my husband Jim would find out about the festival, because he reads just about as much as I do (which is to say "just about everything"), so I texted him to say, "Einstein on the Beach is being performed in Toronto this summer AND WE'RE NOT GOING." And Jim texted back, "We'll see," because if he thinks there's a thing that will make me happy, he wants to find a way to make that thing happen. A couple of days later, he e-mailed me to say, in essence, "I had a really bad day at work and I have to get out of this awful city so I booked us flights and a hotel and got tickets to Einstein on June 8th so we're going." It's not the first time Jim has done such a thing. One day in the spring of 1999, I came home from work and he said, "Have you heard of a new Philip Glass chamber opera called 'Monsters of Grace'?" I had. "Well, we're going." He had arranged the whole thing, ordered the tickets and booked the flights and hotel, knowing that I would love the experience. A lot of people hated "Monsters of Grace". I'm not one of them. At the end, I didn't even stop to think about it, but flung myself to my feet for a standing ovation. There weren't many others standing along with me (and in fact I believe some people were booing), but I didn't care: I loved it, and still listen to the music to this day. A few weeks after we got involved, Jim invited me out for dinner to meet two of his co-workers, Karin and Adele. I imagine we had been talking about art and politics, among other things, but the one thing I clearly recall discussing was "Einstein on the Beach", which I had been listening to pretty obsessively, as is my way. While I had absented myself from the table near the end of the meal, Karin pinched Jim's arm hard and said, "If you let this one get away, I will kill you," which is possibly the most flattering thing anyone has ever said about me. He didn't let me get away. After twenty-six and a half years, Jim and I still find things to talk about. In fact, if you asked me the secret to a happy marriage, I'd say, "Be interesting to one another." We have drastically different tastes in most areas: while there's a bit of overlap, we hardly listen to the same music at all, we have different taste in TV shows and books, movies and theatre. Jim likes opera well enough, but mostly only comedies, whereas I like pretty much all of it. But that's all good! It gives you more things to talk about! Since we live in a small, rather provincial city, the only way we can experience everything we want to, all the operas and museums and movies and cultures, is by travelling, and luckily that's one more thing we have in common: we both love to travel. We're not rich, but we head out as often as we can afford to, and if we were independently wealthy, we would essentially just travel all the time. If my mother ever reads this she will be severely annoyed: even though I visited her in April of 2012 and am going up again this May, she will be peeved that I flew up to Ontario in June of 2012 and didn't even tell her, let alone visit. So: sorry, Mom, but we flew up on Thursday night last June and left on Monday morning and the long weekend was packed with events planned and unplanned, and there was just no time. The tickets we had for "Einstein on the Beach" were for the first of three performances, the night of June 8th. "Einstein" is only nominally an opera: it's sui generis, hypnotically repetitive music and dancing, trancelike singing of nonsense lyrics and numbers and solfége syllables, no characters nor plot. Four and a half hours of music and dance and acting and visual stimulation with no intermission: you're encouraged to come and go as you see fit, and a fair number of people saw fit to leave and not come back. And this may give you an idea as to why: the image on that album cover is a giant glowing slab representing the edge of a bed, but also appearing throughout the opera in various guises. Late in the opera, the object appears on the stage horizontal, and then over the next seventeen minutes or so, to pensive music, it gradually, gradually arises to a vertical position, at which point it (I think) represents a spaceship which slowly takes off and vanishes into the rafters. (When the glowing bar attained its vertical position on the first night, an audience member shouted, "Hurray! ", to the laughter of the entire audience.) If you have an appreciation, or even a tolerance, for that sort of thing, then you might be the sort of person who would appreciate "Einstein on the Beach". Here's another test: Knee Play 3 ("knee play" because it's a joint between longer sections), a piece which is simultaneously classical in structure — it's basically an A-B-A-B aria for a small chorus — and hyper-modern, a staggeringly rapid-fire, pulsating string of numbers alternating with a lullaby of solfège syllables. Before I saw it performed, even having listened to it hundreds of times over the last quarter century, I didn't see how it was possible for anyone to sing such music, but by god, they do it. "Einstein" has many moments of virtuosic performance like that: cruelly difficult keyboard music, an octet of dancers who spend twenty minutes — twice! — whirling across the stage in mathematical permutations, the second time accompanied by a violinist who plays the most fiendish scales and arpeggios. We sat through the whole production without budging: I had taken the precaution of drinking almost nothing the entire day, and Jim has a bladder of steel. You couldn't have gotten me out of my seat anyway: I was transfixed, agog. This music that I had been listening to for more than half my life, and which I had never expected to see staged, was suddenly complete — it suddenly made sense. Jim enjoyed "Einstein", but I more than loved it: I was transformed by it, and my very first thought, after "That is the greatest thing I have ever seen in my entire life," was, "And I have to see it again." And I did. I cancelled the plans we had made for Saturday night and got another ticket — once was quite enough for Jim, but he can entertain himself in Toronto for an evening — and went the next night, and it was even better, because I could understand the visual symbols and the connections between the various elements of the staging. (I also knew where the slow bits were — every opera has them — and could slip out a couple of times without missing anything crucial.) An even larger proportion of the audience left on the second night: a woman behind me said, "This is torture!" to her companion, and they were gone by the end of the second hour. For the next three months after returning home, I was obsessed. I listened to scarcely anything besides "Einstein on the Beach" on my iPod: I have three different recordings (from 1978, 1984, and 1993) and have cobbled together versions of the opera composed of my favourite elements from each one — the 1978 "Knee Play 3", the 1993 "Dance 2" — including a 70-minute version that I listened to almost every day for a month and a half. Gradually I let other music into my ears, but I still listen to "Einstein" often. If I could have, I'd have gone see it again in one of the other cities it played in (still two dates to go! ): but I'm thrilled that I got to see it at all, not once but twice, and I will remember it until the day I die. My first exposure to the Persian poet Rumi was "Monsters of Grace" — his poems are the libretto for the arias and duets — and I guess my second was this Etat Libre d'Orange scent (you can listen to Tilda Swinton reading the poem that gives it its name, if you like). Like This could also function as an imperative sentence: "Like this (or else)." And I wanted to, but I can't, because although it is tremendously interesting in the usual experimental, risk-taking Etat style, it's just not very attractive in the long run. 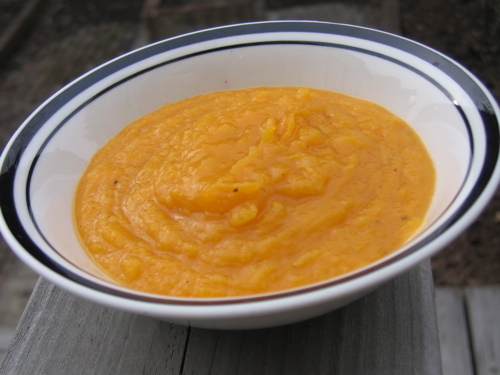 The basic structure of Like This is a gourmand, with a bright citrus flash at the top, an warmly edible, rose-accented heart, and a musky base. The trouble is that that edible middle consists mostly of spice-flecked pumpkin, an appealing fragrance in and of itself, but it goes on and on (it lasts a lot longer than four and a half hours) and never gets any lighter: after a short while it comes to seem thick and heavy and oppressive, to the point that you may feel as if you are drowning in an industrial vat of squash soup with rosewater in it. As usual, lots of people seem to love this and maybe you will too. 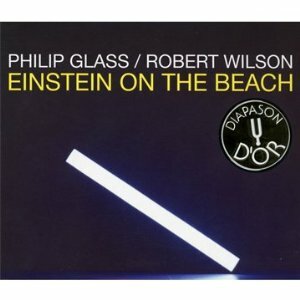 Maybe it's like "Einstein on the Beach", and you either get "Like This" or you don't. I don't: I wore it at least ten times trying to wrap my brain around it, and every single time I had to resist the urge to scrub it off. Enough.